Marek Kopelent studied composition under Jaroslav Řídký at the Academy of Performing Arts (AMU) from 1951 - 1955.From 1959 on he began to discover the compositional principles of 2nd Viennese school and the European avant-garde of 1950s, integrating those into his new style becoming very modern and original. The first piece which opened him the way to the foreign musical world was his 3rd string quartet (1963), thanks to the interpretation by Novák Quartet (Novákovo kvarteto) which performed the piece on its concerts throughout Europe. In 1960s Kopelent made himself well known in the circles of contemporary music in Europe, his music being played on such festivals as Warszaw Autumn, Donaueschingen,Witten and others. Kopelent was also named member of various juries of compositional competitions. From 1965 - 1973 he was active as an artistic director of contemporary music ensemble " Musica viva pragensis", conducted by his colleague Zbyněk Vostřák, and for which he wrote several chamber pieces. The ensemble was playing at many European contemporary music festivals, thus helping Czech new music to reach the foreign audience. In the Prague musical life of 1960s the ensemble represented an important entity, as well as the group of composers around it, forming in 1967 so called Prague Group of New Music, bringing together composers, musicologists and interpreters. In 1969 Kopelent accepted a scholarship from Deutsche Akademie (DAAD) for one year of artistic residence in West Berlin (Berliner Künstlerprogram). After finishing it, unlike many other Czech artists in those times, he returned to his country. It was in the beginning of so called political "normalisation", when he has lost his job of editor of scores in the publishing house Supraphon and found no chance for finding another job. He was ostracized from the new Union of Composers and his ensemble Musica viva Pragensis was not allowed by the authorities to pursue its concert activity. From 1976 he accepted a job of the piano accompanyist in the dance courses for children, which became his main occupation for the next 15 years. During the difficult period of 1970s he composed a lot of pieces, many of them for foreign commissions, but the composer had no opportunity to hear their performances. After the revolution in 1989 Kopelent became for a short time a music advisor at the office of president Havel and from 1991 he was named a professor of composition at the musical faculty of AMU in Prague. 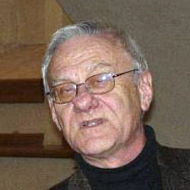 He was a chairman of the Czech Section of the ISCM and still is a chairman of composers association Atelier 90. He was the organiser and regular lecturer to International Composers' Summer Courses in Český Krumlov. In 1991 French government honored him by an award "Chevalier des arts et des lettres". He received also Czech Classic 1999 Award and the Herder Prize in 2001. Nostalgická konstrukce, pro violu, akordeon, tubu a klavír. Otvírání studánek, pro dívčí sbor a klavír. Ovčák a člověk z EU. Malý hudební skeč. Melodram-pantomima. Podivný tanec Podpantoflíček, pro klavír na 4 ruce. Pochybnosti, pro mezzosoprán, flétnu, akordeon a klavír. Show records 61 - 80 from 118.